The Gentlemen and Lady's Club for Eccentrics. The Steampunk Forum at Brass Goggles > General Steampunk > Metaphysical > Meta-Clubs (Moderator: J. Wilhelm) > The Gentlemen and Lady's Club for Eccentrics. 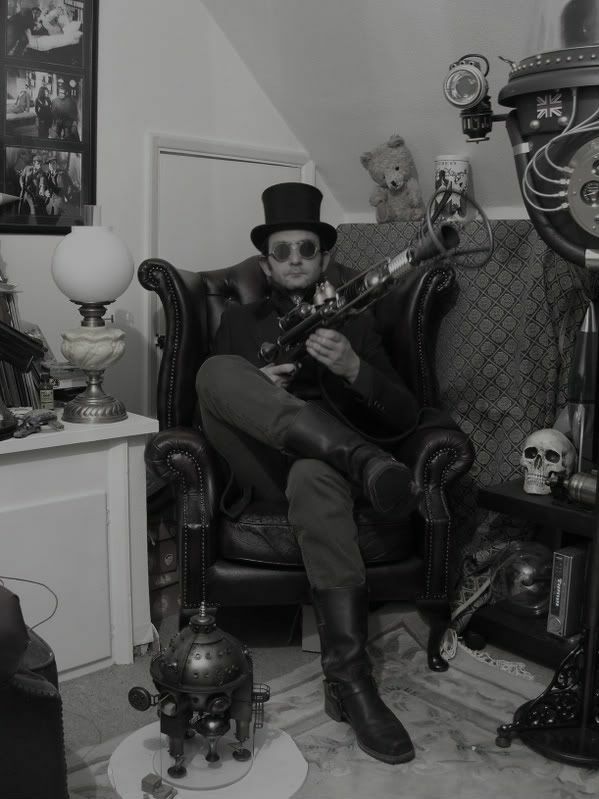 I intend for this to e a club where we can share tales of eccentricity or discuss items of interest for anyone wanting to stand out in a victorian/steam-powered manor. Offer one another inspiration and spread ideas. Re: The Gentlemen and Lady's Club for Eccentrics. I'm quite eccentric... some might actually say I'm a complete loon. I'd be interested in such a club. I hate to blend into the crowd when with just a little effort you can stand so far out of it! I hate to blend into the crowd when with just a little effort you can stand so far out of it! Although I usually prefer to do so in company, a bit less secure doing it alone for the moment, but getting better! If i am not told several times daily that i am ridiculous or that i am silly.. then my day is a waste. Here's a game, When someone turns away for a moment, place something on your head. Then act as if nothing is there. i keep an eyepatch around for just such occasions. Its a dual use, for once they realize its on your eye and turn again, switch to the other eye. The one, true, mark of eccentricity is not to ever, EVER, acknowledge that ones actions, dress, attitude etc. are anything but completely normal. So count me out, I'm perfectly normal. Perfectly normal you say? Oh yes... well what's that bear doing above your left shoulder then? Tried to find something more normal to pick on, but you've done a pretty good job in hiding anything out of character! Herr Doktor's got a bear behind! It was always going to be me. Don't point the F'n gun at something you're not prepared to F'n destroy. Even if it's not F'n loaded. Finger off the F'n trigger 'til you're ready to F'n fire. I was taught by a retired police officer...It shows in his language and actions. Perhaps The Doctor was so busy taking captives and being sinister he had to take the picture WHILST holding someone at gunpoint. Is that a sequel to the chicken Tiramisu? I can see where you're coming from, but I've got to raise a few issues. Blumenthal uses the scienticif method to pin down a method and recipe that lets him re-create a dish over and over again. More often than not, it's bizzare but apparently tasty. As opposed to this vietnamese girl, who collected god only knows what together and compiled it into something that'd have made Abraham Van Helsing take a step back and say "I say old chap, steady on." That may raise problems, then. I thought there was at least a modicum of method to her madness. There may well have been. But it was overpowered by the madness. Indeed, a little madness is, if anything, good. It is when it gives rise to such monstrosity as she made before that it becomes problematic. eccentric is a matter of someone elses perspective. "We'll murder them all amid laughter and merriment. Except for the few we take home to experiment." Like Herr Doktor I shall sadly be unable to participate as I also am COMPLETELY NORMAL. And I have the paperwork to prove it ha ha! I'm in Darkshines sewing swap! You can tell she's a boy, can't you, Mrs. Spanner? I must say, the "Things on head" trick is a good one. Must try that out. Now we all encounter people that simply annoy us in our lifetime. But what if you're too polite to tell them to leave you alone? Well, here's a solution: talk to them in a language they don't know. Understanding everything they say, and then responding in, say, German or French. At first they think you're just being a bit silly. Then they give up and just leave you alone. And no hurt feelings! Something else I find fun is going up to people, drawing on their face in pen ad then saying "You've got pen on your face." I appologise for the damage to your grandfather. I recall reading in the introduction to the Penguin classics edition of The Invisible Man of a fellow who was in the habit of walking through a room in a dressing gown when guests were present and ignoring them, and would then proceed to get dressed and return to the same room to greet his guests as though he had not yet met them, or they seen him, as he liked to believe himself invisible. Now that, I would submit, is a measure of eccentricity to be applauded and aimed for.